dobe CreatePDF is a new application for iPhone, iPad and iPod Touch available at the iTunes App Store .$9.99 universal app that allows user to easily create high-quality PDF documents with support MS word, xlsx, xls, jpeg, png and from scratch on their iOS devices. According to Adobe “CreatePDF brings the same high-quality PDF creation as Adobe Acrobat. oCreates PDF files that look exactly like the original using the same technology as Adobe Acrobat. oConsistent, high-fidelity PDF conversion independent of device or software. Uses Adobe’s online services to ensure there is no compromise on quality or performance. The service does not keep a copy of your original or the PDF document. oCreates PDF files that meet accessibility standards. oPreserves Transitions and converts Multi-media Content for Power Point files. oConvert email attachments or files stored in the cloud or any application by opening them within the Adobe CreatePDF application. 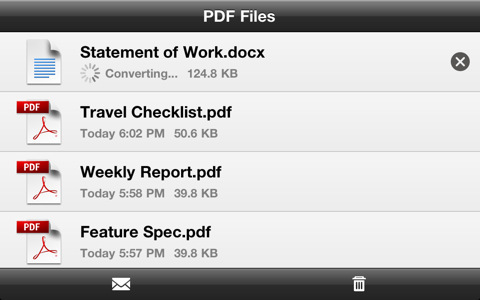 0 Respones to "How to Create And Edit PDF on iPhone, iPod touch iPad With Adobe CreatePDF App"